Wahooooo! Look at that! Our team is already halfway to our goal! (And we've topped last year's amount by over $200 so far.) 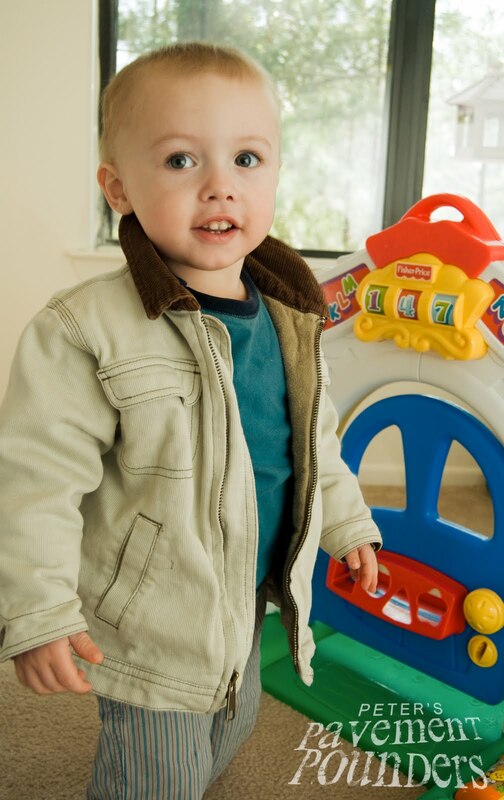 Thanks to everyone who has donated and all the walkers who are fund raising for our little boy. 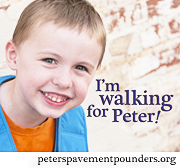 You are making Peter's future possible. Please feel free to use this image on your blog, Facebook, etc. Print it out and hang it up! You are amazing! 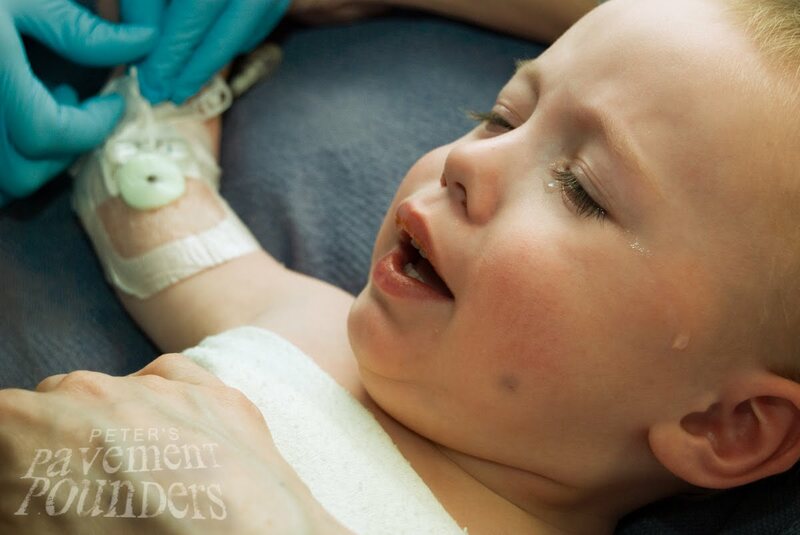 In the past month, Peter has had appointments at the pediatrician, dentist, CF clinic, and ENT. Since CF affects so many systems of the body, we tend to have a lot of doctor's appointments. 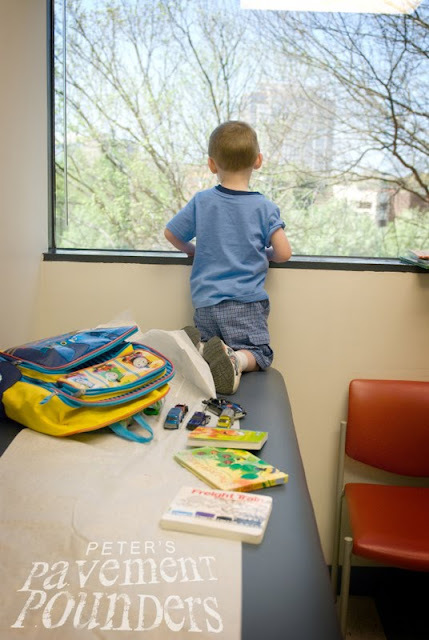 The other day we were going out to the car, and Peter assumed, "We going to a doc-der's?" A printout of all of Peter's current meds and treatments (I also keep a mini one in my wallet just in case.) -- This is a huge time-saver at the doctor's office. Here are a couple pics from our last CF Clinic appointment (a quarterly visit with all of Peter's CF specialists that lasts 2 - 3 hours). One of the most common questions I get lately is "where does my money go that I donate to your walk fund--does it go to your family or to Peter?" At this time, we are fortunate enough to have good insurance and employment that pays for Peter's medication and treatment. Our fund-raising efforts go to support the Cystic Fibrosis Foundation (CFF), an amazing organization that has been the catalyst behind nearly all of the progress made in the effort to find a cure for this disease. 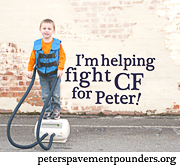 Peter's life is directly impacted by the progress of the CF Foundation's efforts. Thank you so much if you have donated, pledged to walk with us, or have contributed in any way. If you haven't, please make a difference today. You will be one of the reasons Peter has a longer and fuller life. Donate or walk with us to find a cure for CF. Note: We are not currently using this recipe. Since new research came out that tap water is not safe to use in sinus rinses, we have switched to using distilled water and sinus rinse packets. Here's the recipe our ENT gave us for rinsing out Peter's nose. It is an awesome way to fight infection and mucus in the sinuses and Jacob and I have our own sinus rinse bottles for times when we are sick or congested. Choose a one-quart glass jar that is thoroughly cleansed and sterilized, and fill with distilled water. Mix ingredients together and store at room temperature. Discard after one week. Do not put used solution back into the quart because it contaminates your solution. If you find this solution is too strong, you may decrease the amount of salt to 1 or 1.5 teaspoons. With children it is often best to start with a milder solution and advance slowly. As part of Peter's daily treatment routine, we use the NeilMed Sinus Rinse bottle to clean out his nasal cavities with saline solution everyday -- usually morning and evening, though sometimes more frequently if he is congested. It's not pleasant, and Peter doesn't really like it, but it is necessary. Peter makes a lot of yucky mucus especially in his sinuses, so daily sinus rinses help keep the mucus from building up. 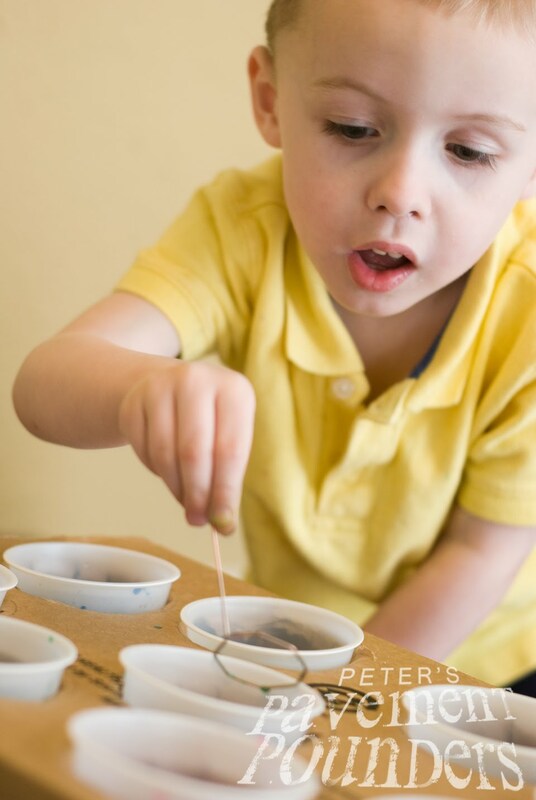 When Peter was diagnosed at a year and half old, his sinuses were nearly totally blocked. He had two sinus surgeries to carve out some room to breathe. Here is an image of Peter's CT scan before his surgeries. 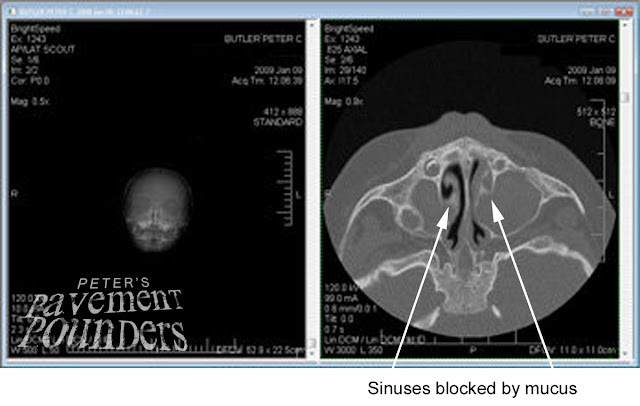 You can see what a normal CT scan should look like here: http://www.aaaai.org/patients/publicedmat/sinusitis/whataresinuses.stm. After surgery, Peter could breathe through his nose! Another thing I noticed was sneezing -- he never really sneezed before because he was so blocked up. Now, it's a different story. He breathes a lot more regularly, although sinus congestion is always the first thing we notice when a cold is coming on. 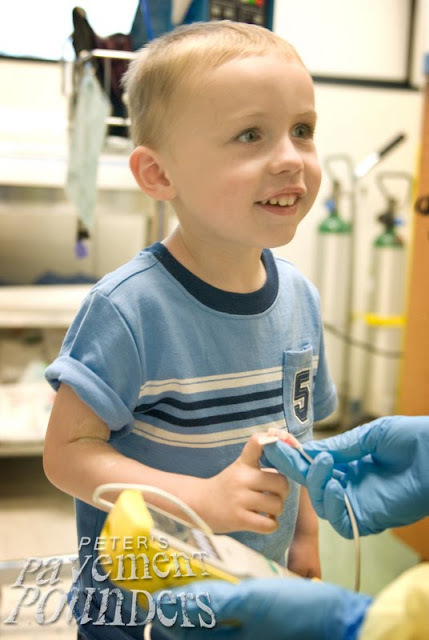 We are headed to the ENT this week for a follow-up to last year's surgery. Here's hoping all goes well and our diligence with the sinus rinses has kept him clear. 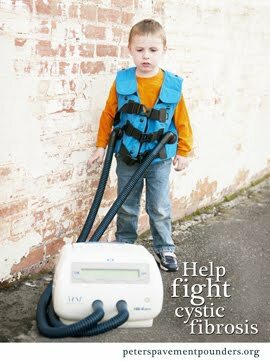 It's normal to feel angry, upset, sad about CF. It takes a while to adjust to the reality of the disease. CF is not an excuse to stop enjoying life. When I focus on what "could have been" or "what might be" (and it's often been assuming the worst will happen), I rob today of its happiness. 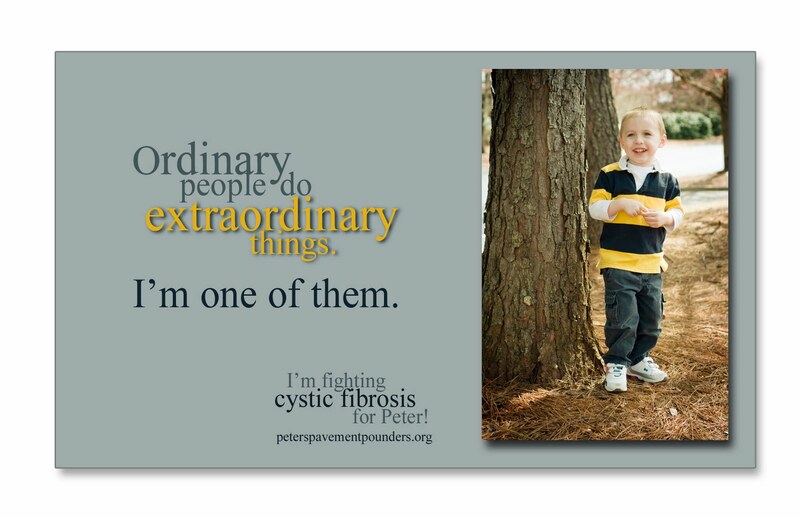 It's not my fault that Peter has CF. I can't choose what genes I pass on to my children. 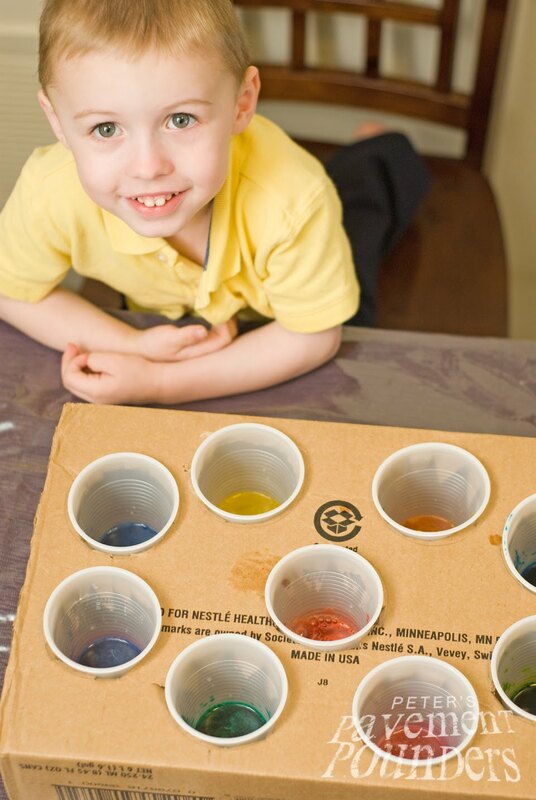 By fund raising, we are working towards a cure and new treatments. 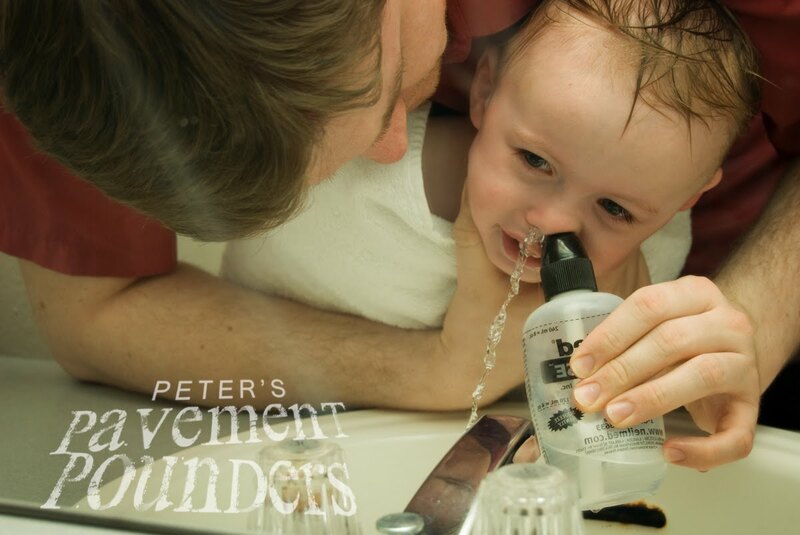 Being compliant with Peter's meds and treatments teaches Peter that it is important to take care of himself. I have to take care of myself -- including exercising, eating right (not doing so good with that one lately), spending some "me" time everyday, and getting to bed at a good time every night. Peter can have a great life even if it is shortened. We can make our own happiness even in discouraging circumstances. Here are some fun photos from Easter. 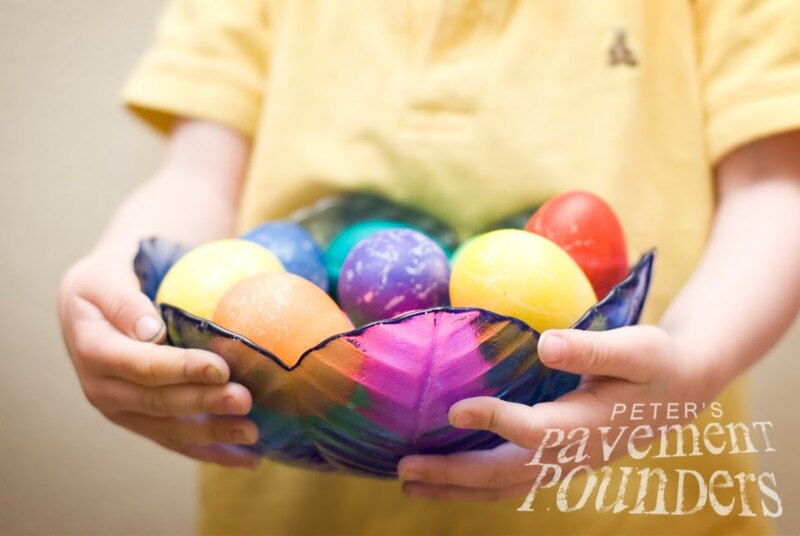 It was the first time Peter dyed eggs!